This article is about a collectible item. For the Gaddget from Mario Party Advance, see Power Star (Gaddget). For a collectible essential to winning in the Mario Party games, see Star (Mario Party series). For Rosalina's Final Smash in Super Smash Bros. series originally named "Power Star", see Grand Star (Final Smash). Artwork of a Power Star from Captain Toad: Treasure Tracker. Power Stars are collectible items that can grant Mario access to more levels in-game (like Goal Poles from the original Super Mario Bros. and the New Super Mario Bros. series), unlike the similar-looking Super Stars, which only give brief invincibility. In Super Mario 64, Super Mario Galaxy, and Super Mario Galaxy 2, when the star for any given level has been collected, playing the level again will turn the Star into a translucent version of itself (similar to how Star Coins work). This Star can be collected, but it will not add to the player's total Star count. Power Stars (from left to right) from Super Mario 64 and Super Mario 64 DS. Power Stars in Super Mario 64 and Super Mario 64 DS are scattered throughout the different courses. The Power Stars are usually found in the open or will appear after completing a certain task. Boss enemies will have a Power Star, and collecting eight Red Coins will cause a Power Star to appear at a Star Marker. Collecting one hundred Coins in a course will cause a secret Power Star to appear. In Super Mario 64, there are a total of seven Power Stars in each course: six are found by completing the specified objective and the seventh is the 100 Coin Star. Fifteen Power Stars are also found in secret courses or are held by Toad. Seventy Power Stars are necessary to reach Bowser, with one hundred twenty Power Stars in the game total. In Super Mario 64 DS, there are a total of eight Power Stars in each course: seven are found by completing the specified objective and the eighth is the 100 Coin Star. Thirty Power Stars are also found in secret courses or are held by Toad. Eighty Power Stars are necessary to reach Bowser, with one hundred fifty Power Stars in the game total, thirty more than in the original game. The Jumbo Star collected after beating Bowser at the end of the game does not count toward the star total. Super Mario 64 DS also introduces Silver Stars, which are not as powerful as regular Power Stars; five Silver Stars are equal to one Power Star, and they combine to form one once they are all collected. 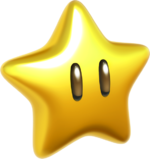 In the multiplayer mode of Super Mario 64 DS, stray Power Stars can bounce non-stop, similar to dropped Silver Stars in the same game, a trait that is shown only in this game. Mario getting a Power Star in the Good Egg Galaxy in Super Mario Galaxy. Power Stars make a return in the Wii game Super Mario Galaxy, where there are a total of 121 stars to collect for each Mario and Luigi (for a total of 242). They have a more metallic and rounded appearance than before. There are four types of Power Stars: First, there are regular Power Stars which serve the same purpose in other 3D Mario games. The second kind is the three Green Stars that, in addition to acting as normal Power Stars, unlock the Green Launch Star in the Comet Observatory which leads to the Trial Galaxies. The third type is the Red Power Star. There is only one in the game; it appears in the Super Mario Galaxy mission "Gateway's Purple Coins". Last are the seven Grand Stars, the first of which, and the only one obtained without a boss fight, is the first star in Gateway Galaxy. Subsequently, the other six Grand Stars are each collected by beating Bowser or Bowser Jr. These power up the Comet Observatory and unlock new Domes to explore. Silver Stars also return from Super Mario 64 DS, working in the same way, though they float alongside Mario once collected, and can't be lost by taking damage. In Hurry-Scurry Galaxy, as well as the planet that appears in Sea Slide Galaxy when the Hungry Luma transforms in the third mission, collecting notes turns the black hole into a Power Star. Mario and Yoshi getting a Power Star in Yoshi Star Galaxy in Super Mario Galaxy 2. In Super Mario Galaxy 2, Power Stars play the same role as in Super Mario Galaxy. There are 242 Power Stars in total (116 normal Power Stars, 6 Grand Stars, and 120 Green Stars). If the Cosmic Spirit is used to complete a mission, the star collected will be a Bronze Star instead of a gold one. Mario standing next to the Tail Tree and a Power Star. Power Stars, looking as they originally did, reappear in Super Mario Odyssey, but only in the Mushroom Kingdom. They replace the Power Moons for that portion of the game. However, they are still referred to as Power Moons, even when being collected. The reason for this is hinted at by Cappy when collecting one for the first time, as he suggests that Power Stars and Power Moons are the same objects with different shapes. The jingle that plays upon collecting a Power Star in Super Mario 64 replaces the standard Power Moon jingle in this kingdom. When loaded into the Odyssey, they appear as regular Power Moons, even if loaded into the ship in the Mushroom Kingdom. Power Stars reappear in the game Mario Pinball Land, working just like they do in Super Mario 64, obtained after completing certain trials, such as defeating a boss or a certain number of enemies in time, and their use is to make Mario's way to Bowser. At the end, the number of Power Stars obtained determines how much the point bonus is worth. A Power Star appears in Rosalina's Final Smash in Super Smash Bros. for Nintendo 3DS and Super Smash Bros. for Wii U. In Super Smash Bros. Ultimate, it is replaced with a Grand Star. Power Stars reappear in Captain Toad: Treasure Tracker, appearing at the end of each stage. However, unlike in previous 3D platformers, which has the Power Stars counted when collected, the game does not count Power Stars, treating them more as Goal Poles in that they only serve to be the end of the level. In Super Mario Maker, both the Captain Toad and Toadette Mystery Mushroom costumes hold up a Power Star in their poses when the player presses . While Power Stars themselves do not appear in Super Mario 3D World, the Green Stars work similarly, unlocking levels should enough be collected. In the Super Mario Mash-Up Pack in Minecraft, a Power Star makes a small appearance on a painting of a Star Door. The jingle that plays when collecting a Power Star in Super Mario 64 was arranged in Super Mario Odyssey as the jingle that plays when collecting a Power Moon. The original jingle itself plays in the Mushroom Kingdom. The music that plays in the Moon Kingdom in Super Mario Odyssey shares similarities with the ambient music heard in Super Mario Galaxy and its sequel before Mario/Luigi collects a Power/Grand Star in certain missions. This page was last edited on April 8, 2019, at 17:49.